Inhabiting countries of South and Central America like Costa Rica, Columbia, Bolivia and Peru, the poison dart frog is a stunning, bright colored frog that secretes a poisonous toxin. The science community only discovered this unique frog in the 1960's, but it has been known by tribes for many years. By the name of the frog, one might think that it is somehow able to shoot poisonous darts, but this is simply not the case. The poison dart naming comes from the fact that tribes in the rainforest used the poison on the tips of darts that they would use to subdue a threat. The poison dart frog is not just one frog, but an entire species of frogs that contains well over 100 individual types of poison dart frogs. Usually, these frogs are quite small and measure less than 1 inch long, but some species can grow up to about 2.5 inches. While the poison in many species of poison dart frogs may not be enough to kill a healthy human, there have been instances where the poison entered a cut or scratch which resulted in death. Their poison is quite effective in subduing their predators, however, if a poison dart frog is born in captivity, it's unlikely that they will contain any poison. The poison that is developed in the frog while out in the wild is because of it's diet of ants, termites, beetles and other insects. When they no longer eat the poisonous beetles of Central America, the toxins in their body are no longer produced, making them harmless. Most of us are accustomed to seeing frogs at the edge of a pond, marsh or stream, but the dart frog is different. It does not have webbed feet and is therefore not a good swimmer so you won't find one of these frogs living in ponds. Unfortunately, the Poison Dart frog is experiencing a population crisis and is on the endangered species list. Over the years, destruction of rainforest land as well as droughts in their regions, these frogs have decreased in numbers. Fortunately, pet Poison Dart Frogs are bred only in captivity and are not collected from the wild. The bright colors of these frogs are just incredible and it's no wonder why people want to keep them as pets. With proper care, the Poison Dart Frog can live for many years in captivity. If you were to come across a poison dart frog you would probably be surprised at the size of these sometimes fatally poisonous frogs. Of course, you won't stumble across poison dart frogs, or poison arrow frogs, anywhere in the continental United States. They are normally found from Brazil to Costa Rica; throughout the warm tropical forests of Central and South America. Occasionally they can be found on particular islands in Hawaii. They're, on average, up to 1 inch long, but Golden Poison Dart Frogs can be around 2 inches. Their scientific name is Dendrobatids, and there are over 150 species of this eye-catching, toxic frog! Poison Dart Frogs can display colors of red, blue, green, yellow, black, gold, or copper. They flaunt vibrant colors in flamboyant designs that are useful in turning away potential predators. Scientifically, this is called aposematic coloration, which basically is when coloration is used to scare off predators. Poison Dart Frogs are very small; they are normally no longer than an inch, with few exceptions. The female poison dart frog places her eggs either on land or other suitable places, such as a leaf upon completion of the mating ritual. Poison Dart Frogs' mating ritual begins with the male vocalizing a sort of mating call until a suitable female is attracted. The eggs are enveloped by a sticky, gel-like substance that is similar to jelly, and they will remain there for two weeks. The eggs are regularly checked on by a parent, though it is typically the male who assumes this task. This has to be done to ensure they don't dry out, as the parent will moisten them during each visit. After the two weeks, the newly hatched tadpoles will be transferred onto the back of a parent... again this is normally the male. They are transported on the back, safely kept in place by a secretion that prevents them slipping off. The tadpole Poison Dart Frogs are taken to a new location such as puddles, car tires, tree holes, bromeliad, or anywhere that offers a small, wet area. This is the point where the parent leaves, and the tadpoles are left to continue growing and developing. Not every species of Poison Dart Frogs are toxic, but there are some that are exceptionally toxic, and even fatal. The most toxic of the Poison Dart Frogs are the Phyllobates terribilis of Colombia. It's a bright yellow in color, and you can be harmed by simply touching it. The local population captures these frogs and drags their blowgun darts along the surface of their body to coat them in the poison, and then releases them. Poison Dart Frogs as a pet frog? Though you may think this, it is becoming more and more common. Poison Dart Frogs that are captive bred are non-toxic. They may not be the best suitable species if this is going to be your first pet frog, but they are far from the most difficult to care for. Poison Dart Frogs provide a beautiful addition to your home with their spectacular colorations and inhabitant. In captivity, a Poison Dart pet frog can live up to 15 years. Be aware of species with very bright colors! This is a trademark characteristic of Poison Arrow Frogs and many other toxic species. It's also a natural mechanism to warn predators to stay away. * The ultra bright colors of the poison arrow frogs are a warning to predators. * Numerous amphibians generate toxic compounds through the glands and carry trace amounts of poison on the external parts of their bodies. 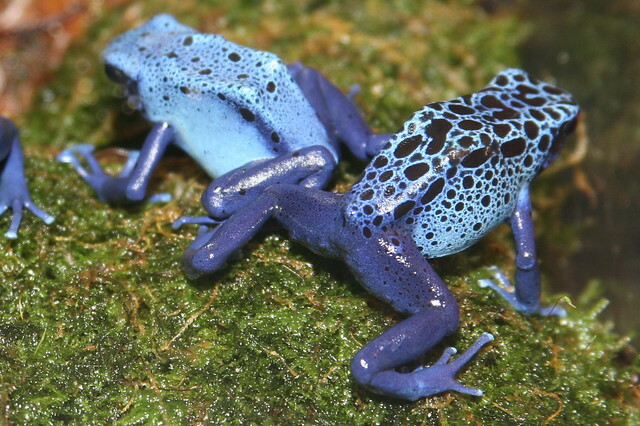 Poison arrow frogs produce poison that is strong enough to severally damage human beings. * Native tribesman in Columbia utilize ancient techniques that collect the poison from the frogs. After collecting the poison they lace their arrow tips with the poison and create a powerful weapon that can poison prey with or use against rival tribes. * In lesser amounts, the poison from Arrow Frogs can be used on humans for its muscle relaxant properties. * Females lay eggs on land in damp areas. The males then guard the eggs until they hatch and become tadpoles. The babies then crawl onto the backs of their fathers while the father searches for water. Once the father finds suitable amount of water, he shakes the babies off his back and from that point on they are on their own. * Dart Frogs are exotic pets that require extra caution while keeping them as pets because of their poison secretion properties. Even 1/1000th is enough to potentially cause serious harm to any human being. * In captivity they can live up to 10 years. * Their use their sticky tongues to capture prey such as small spiders and termites. They capture their prey by using their sticky, retractable tongues. If you found this interesting take a look at more cool Poison Arrow Frog [http://www.topicjax.com/poison-arrow-frog-facts] facts.